Agriculture once represented a sizable share of Puerto Rico’s economy. Could a return to the land save the island from economic collapse? SAN JUAN, Puerto Rico – Farmers and food producers came from all corners of Puerto Rico in May for Agrohack, a conference to address the role of Puerto Rican agriculture as a response to the island’s deepening economic crisis. Organized by entrepreneur Carlos Cobián, participants ran the gamut from industrial producers, small farmers, and community-supported agriculture (CSA) organizers, to Monsanto representatives. Despite their differences, conference participants agreed on one thing: farming and food production might just save the island from economic collapse and a brain drain problem that has worsened as nearly half a million Puerto Ricans moved to the mainland U.S. over the past decade, most of them prime working age. Forty percent of those who emigrated reported that their reason for leaving was a lack of employment opportunities on the island. Would people stay on the island if viable job prospects existed? It’s an important question, but one the government has largely ignored. Instead, it has prioritized efforts to cope with the immediate effects of the economic crisis, namely trying to restructure its massive $70 billion debt. In the absence of government support, Cobián and others have stepped in, insisting that Puerto Rico can be pulled back from the brink by going back to the land. Puerto Rico once produced sugar, coffee, plantains, and other tropical fruits. In 1940, farming activity represented nearly 34 percent of the GDP. But agriculture collapsed by the second half of the 20th century, largely due to Operation Bootstrap, an industrialization project introduced in 1947 by the U.S. government. By 2002, agriculture contributed just 1 percent to the GDP. Bootstrap put the island on an industrial fast-track, drawing U.S. mainland businesses through tax exemptions and other attractive incentives that continued well into the 1990s and early aughts. The 2006 economic crisis marked a turning point and industry began to collapse, leaving many Puerto Ricans out of work and with few employment prospects. Since then, the crisis has become more acute, and the government is struggling to avoid shut-down. Cobián thinks there are enormous opportunities in a return to farming. 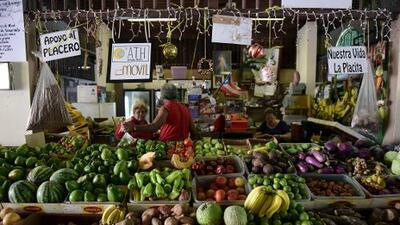 More than 80 percent of the island’s food is now imported. “We could be supplying 90 percent of our own food needs and keeping money circulating locally,” he said. And, he adds, 73 percent of farmable land has been sitting fallow for at least three decades. Looking at those numbers, Cobián doesn’t think Puerto Rico needs a rescue plan. He thinks it needs to get back to the fields. As Cobián sees it, the moment is ripe for farming to make a comeback, largely thanks to technology. Over the course of Agrohack, stories were shared by small farmers who deal with surpluses by using Facebook, for instance, to announce flash sales to local chefs, who band together and buy the surpluses and then create entire menus around a single ingredient, such as corn. And Salvador Ramírez, the island’s former Secretary of Agriculture and consultant to the island’s Econo chain of supermarkets, announced that the company would be launching an app this summer that connects farmers to Econo to facilitate that goal. There are already indicators that efforts to connect farmers and food producers to the market are having some success. Ortíz reported that 92 percent of the ground beef Walmart Puerto Rico is selling comes from Puerto Rico, and more locally grown and made products are being offered across the island, both on the shelves of large and small supermarkets, as well as at restaurant tables. There was talk of implementing technology that monitors climate conditions and provides more efficient, effective interventions; of cultivating a network of beekeepers to produce Puerto Rican honey; and leveraging the resurging agriculture industry to stimulate Puerto Rico’s current economic engine: tourism. Pedro Bengochea, the president of specialty coffee producer Castañer Supremo, said he has an ambitious agrotourism plan. His project, and others like it, are the response to critics of the ag renaissance who say Puerto Rico should simply continue to expand its tourism offerings and forget about farming. It remains unclear whether the government plans to help bring farming to scale. Not only is it distracted by the debt problem, but it has limited resources to help resuscitate farming. Governor Ricky Rosselló signed the Labor Transformation and Flexibility Act into law just a few weeks after his swearing in this January, insisting that the act will increase jobs on the island. But his own administration admitted it had no job growth projections to share publicly, and the act mentions nothing about job creation initiatives. The Department of Agriculture attempted a small-scale project between 2012 and 2015 that increased the acreage of designated agricultural reserves by 20 percent, but with the still-new Rosselló administration it’s hard to know whether such projects can continue and expand. It’s also unclear whether the government will embrace big ag interests, such as Monsanto, which also had a booth at Agrohack and whose representatives sat on at least one panel. Coca-Cola, too, has significant interests in the island’s coffee business as well as a history of fair labor violations on the island. Cobián said there’s enough people power to usher in a true agricultural comeback. He believes government will eventually follow when it sees success, but he doesn’t plan to wait. “By bringing together people from different sectors – tech, finance, farming – who have fresh ideas, we can come up with creative solutions to our own problems,” he said.